• 3 ranges, 2,000/20,000/100,000 LUX. • LUX & Foot Candle unit selection with default. 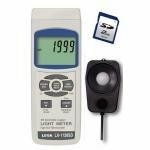 • Auto range for light measurement. • Spectrum of photo sensor meets C.I.E..
• Light measurement with zero adjustment by push button.